It’s not exactly the best pairing, but a Taiwanese vendor has married Google’s smart glasses concept with a set of over-the-ear headphones. ChipSiP Technology showed off its “SiME Smart Headphones” on Tuesday during the Computex trade show in Taipei, and I had chance to try it on. 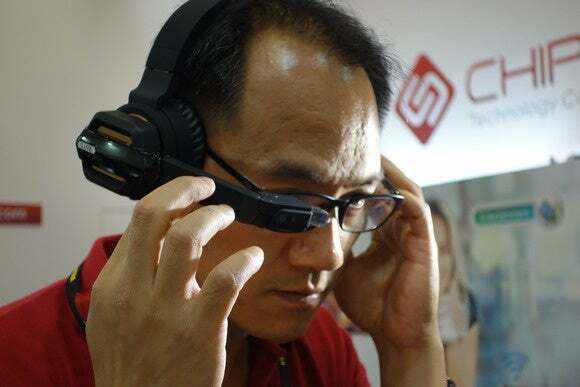 Last year, ChipSiP demonstrated a smart glasses product that it started selling in January for US$550. The company has taken the same concept and applied it to a pair of headphones. At first glance, it looks like a pair of over-the-ear headphones with a large microphone on the end of a long plastic arm—but the microphone is actually a transparent display. ChipSip intended the product for audio and video entertainment, allowing users to stream music and watch movies from their smartphone via Bluetooth. The transparent display itself works like the one in Google Glass. It is connected to the headphone via a rotating hinge, which can spin from 0 to 180 degrees. That hinge makes it easy for a user to lift the display away when not using it. Although it seems like a worthy idea, it was simply too much hassle to use during my brief time with it. Part of the problem was that I never managed to perfectly fit the transparent display over my right eye. It was always slightly off, and I often had to try to center it with my hand. While the company’s goal is to bring video entertainment to the headphone user, the display itself just felt too small and blurry to view. Watching video from a smartphone is still the superior option, especially since the headphones’ battery only last two hours on a charge. Inside ChipSiP’s headphones is 1GB of RAM, 8GB of storage, and a 5 megapixel camera. 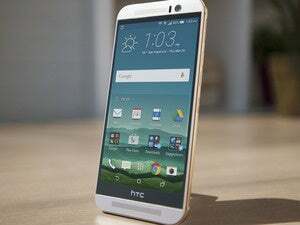 The headphones run Android 4.4, with the cursor guided by a touchpad on the side of the headphones. Seeing it wasn’t easy: the interface appeared faint on the transparent display. The company plans to sell the smart headphones from October, probably at around $550. ChipSiP’s sees a potential market in museums, which could use the headphones in tour guide systems.